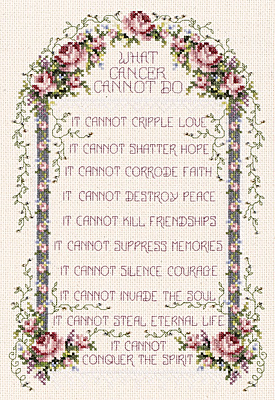 This powerful sentiment from Stoney Creek fosters hope in every stitch. Give the gift of hope and encouragement to anyone in your life touched or threatened by cancer. Made in the USA by Janlynn. Each kit includes: 14-count 100% cotton off-white Aida, 100% cotton 6-strand carded floss, needle, graph and multi-lingual instructions. Finished size: 8.25" x 12".